Protesters chanted "Shame to NTV!" and "Russia without Putin! Russian police have arrested dozens of people picketing Moscow's TV tower over footage that accused the opposition of paying anti-government protesters. The film, The Anatomy of Protest, was aired this week on NTV - a channel owned by state-run firm Gazprom. It said protesters against Vladimir Putin's election as president in March had received "money and cookies". The documentary has caused a backlash on social media and angered some journalists, who accused NTV of lying. Despite mass protests against what the opposition says were fraudulent presidential elections on 4 March, Mr Putin says he won fairly. Nearly 100 people were arrested outside the iconic Ostankino tower on Sunday, reports in Russia's media say. 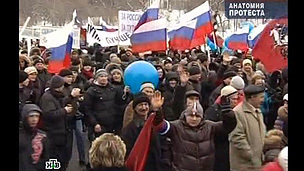 Opposition leaders Boris Nemtsov and Sergei Udaltsov were among those held during the unsanctioned rally. The demonstrators wore white ribbons (the symbol of the protest movement) and chanted "Shame to NTV!" and "Russia without Putin!" The documentary has caused dismay among supporters of the opposition and journalists alike, and led to a social media uproar, with the hashtag "NTVlzhet" ("NTV tells lies") becoming the leading trend on Russian-language Twitter. Alexei Navalny, a key opposition figure and one of Russia's most influential bloggers, was accused of spreading misinformation and having "too many bodyguards" who were "beating up journalists". The film has also prompted talk of an NTV boycott and was even criticised by some of the channel's own journalists. Despite this, NTV plans to broadcast the documentary again later on Sunday "due to popular demand". Incoming Russian President Vladimir Putin needs to conjure up some operatic-style magic if he is to survive his third term in office, the BBC's Steve Rosenberg writes. What next for Putin's Russia? Russian Foreign Minister Sergei Lavrov accuses the Kiev authorities of breaking last week's Geneva accord on resolving the Ukraine crisis. 1: Did removing lead from petrol spark a decline in crime? 3: What hours do teachers really work? 6: What hours do teachers really work? 7: Did removing lead from petrol spark a decline in crime?